I’ve been asked to go into this in brief in the Camino talk next week so I think it’s an ideal time to post about it. The majority of people have found out about Santiago and it’s many Ways from the amazing Martin Sheen and Emilio Estevez’s film, ‘The Way’. Others may have read about it in travel magazines or books, most notably, The Pilgrimage by Paulo Coelho. However, I found out about it purely by accident. I have the great organisation, Aware, to thank for in this case. Because if it was not for them, I would not have this addiction and urge to go back to Spain each year. In the middle of 2010, I was handed a hastily put-together leaflet telling me about their plans to “Walk the Camino”. At the time, Aware was my chosen charity and I have fund raised a number of times for them. Anyway, I read through the leaflet but put it to one side once I had finished, not giving it a second thought. It just wasn’t for me but I promised that I would advertise it where I could. A number of weeks later, I saw the leaflet and thought..”well, let’s see what’s involved first?”, and wrote an email to the organisers. Within a few days, I received a information pack giving me a little bit of information about the Camino, the plan, what to bring, costs and what was required to fundraise! At that stage, my two feet had taken their first steps, so to speak. I had started walking longer distances and had started to fund raise for this great charity. I will never forget the Table Quiz night in a packed pub in Dublin when I raised the vast majority of funds. However, while things were starting to fit into place, little did I know what to expect when I arrived there. 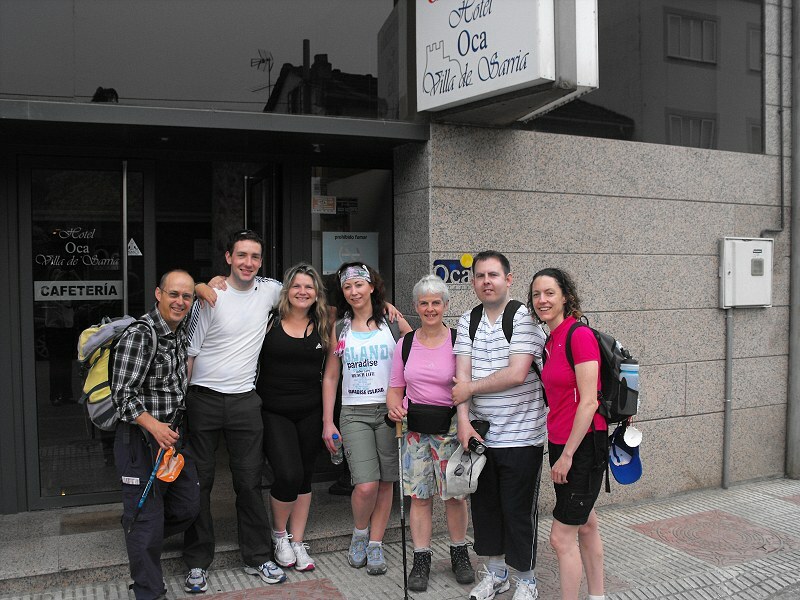 I had done very little in preparation for the actual Camino, spending more time on fundraising. 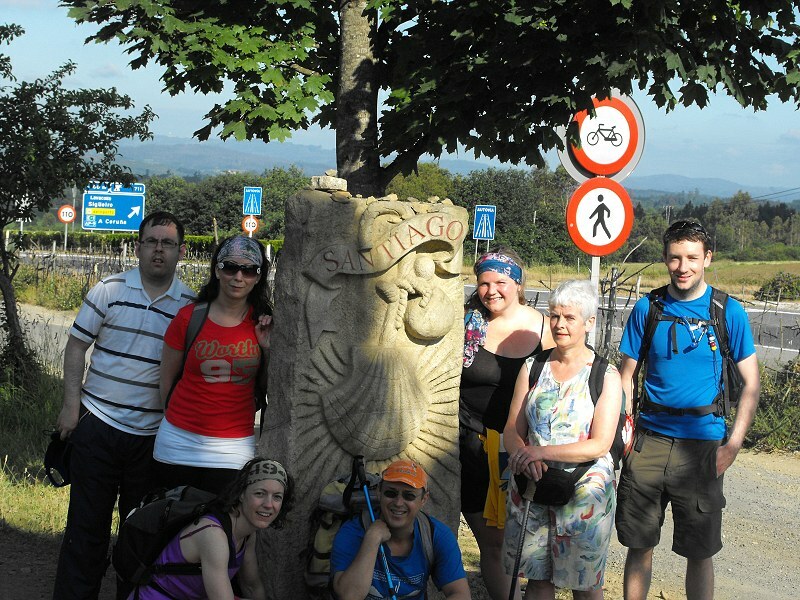 June 3rd 2011 – All 8 of us boarded our flight for Santiago de Compostela. It was my 1st time in Spain with 0% Spanish. We were carrying suitcases, save for one guy with a backpack. On arriving in Santiago, we met our guide, and zipped across to Sarria, some 110km westwards. He got to know us all and gave us details of our next day’s walk. We were of all ages, from all over Ireland, with various abilities. I was pretty sure I could walk 20km the next day, but for 5 or 6 days in a row..time would tell. We checked into our nice hotel on arriving in Sarria and had some dinner. The one thing I remember is desperately wanting to stick with one of my fellow walkers as I had no spanish. I felt totally lost otherwise. The following day, we left our hotel with nothing but a day-pack, a packed lunch and some water. Within a few kms we were greeted by a whole host of people walking in the same direction..whoa!..”is it normally this crazy?” I thought to myself. I also noticed folks carrying large rucksacks. “Is this normal?”, I thought again. I’m not sure I would be able to do that, and not at the pace they were going at. I met people from the world over, quite a lot were willing to stop and chat and tell you about their first day. I learnt my first few words of Spanish also..”de donde eres?”..”where are you from? You either get a look of bemusement, which means the person in question is not Spanish, or a conversation will begin! That day I was introduced to the Camino, and I was delighted to arrive in Portmarin some 22km later. The following days were tough, I won’t lie. I suffered. But, I enjoyed my times with my walking buddies. I loved the Spanish way of life and culture and when I arrived in Santiago, I celebrated, took it all in and left. I didn’t think I would come back. For me, I had “Walked the Camino”. In many ways, my Caminos from 2012 to May 2015 have been different to 2011, but I will always be thankful for that hastily put-together leaflet given to me in 2010.
or as they say here “La Fheile Padraig sona diaobh!”. Dublin was a sea of green today as we celebrate who we are. Over half a million people crowded Dublin’s streets to watch the annual parade, a staggering figure! Added to this, there are many smaller affairs organised around the country in rural villages and towns alike. Many countries around the world held parades also. the parade, I decided to take part in the annual Harbour 2 Harbour walk which is organised by my favourite charity, Aware. Aware is a fabulous charity supporting those with depression. 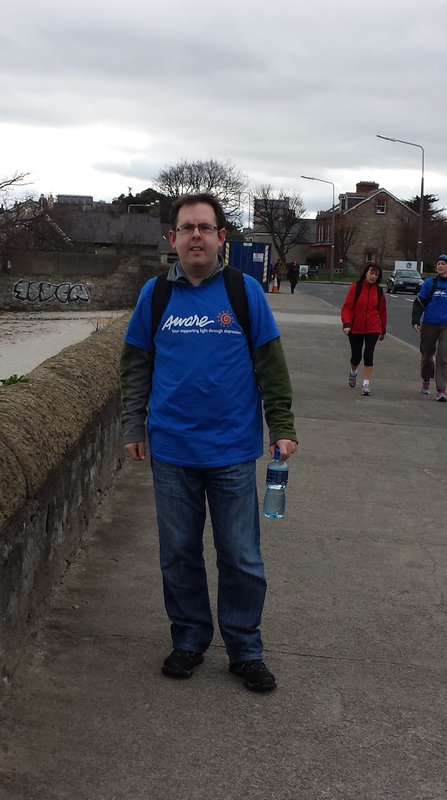 The walk was 25km long (16 miles) and started in Dun Laoghaire harbour in the south of Dublin, right up to Howth harbour, which is in the north of Dublin. The walk is mostly on flatlands, but there is a slight rise into Howth that added variety to the day. The weather was perfect and I had the company of my friend Laura, so I didn’t have to resort to talking to myself. I had a little difficulty with my back close to the end of the walk but that “may” be down to walking on concrete for the whole day. These long walks are just what I need before I venture off to Spain. I reckon close to 1500 people turned out and the sun made an appearance or two during the day. You can find out more about aware by clicking here. It’s over a month since my last post and it’s well and truly time to update this thing, or at least say a few words to console it. So what have I been doing with myself since…?? Well I am a month back from my Camino trek in June (pictures here and here. It was a thoroughly enjoyable experience and am looking to return to walk some part of the Way in the next year. I met some great people, and we continue to keep in touch. Let’s not forget all monies raised were donated to Aware. It is something I would encourage you all to do, even mark it down on your bucket list when you hit that territory! I had written up a long piece to be published but didn’t get round to finishing it, so I dropped it. I may come back to it soon. It was tough to get back to the swing of things after I got back. It took me a week or so to settle down, I just found it hard to focus as my mind was on the previous 10 days. I started up this blog to post pictures, either from my iPhone or camera. I haven’t been doing that alot recently, but will do. Well I received my itinerary this morning for my trip. I will be boarding a flight to Santiago on Saturday 4th and arriving there just before 1pm. I’m sure there will be others on board who will be taking part in the walk, and they will go about it at their own pace and speed. We awake at 7.30am each morning which is fine by me, but I’m sure the late nights we will have will change my opinion sharpish. It’s amazing the amount of good wishes and positive feedback I am getting for doing this from work, Facebook and on Twitter. Even two years ago I would never have thought of doing it and if it was not for my father working for Aware, I would never have heard of the Camino. I hope to take a good few pictures and eventually upload them. This will probably be the last post I make before then so over and out until I arrive back. I’ve got little over three weeks now before I head off to sunnier climes to Spain. We head off on the 4th to Madrid and after a long drive to Sarria we camp for the night before starting the trek. As far as I am aware, there are 9 taking part, three of which I spoken to already. So I have great reason to be looking forward to this and the challenge. So far, I have raised just over €500 so I have a bit to go before I hit my target. I am working away with some fundraising however. A GAA Fantasy football league, which I mentioned in my previous post, has been arranged and that is due to start on the 22nd of this month. Also I have a table quiz organised for the 13th of May and I am hoping a load of people turn up as it will be good fun. And after all it is Friday! Have been slacking on the practice to be honest. Up to mid-April I was walking roughly 5 hours a week, including 10km walks during the weekend. The last few weeks I haven’t done much, mostly due to a lack of motivation and when you have bad days at work, exercise is the last thing you want to do. Just need to get back in gear again and I will be ok.
Other news. I went along to my 2nd meet up of Twitter users last night. Some people I have met previously, and some I met for the first time. Aptly called DubTweaster, a good crowd met in Solas on Wexford Street for some pre-party drinks before going next door to the Village. I had a great night! I have met some good friends from Twitter in the last 6 months and it has kind of kicked my social life back into shape again. Much drink was consumed and many creme eggs were eaten 🙂 Here’s to the next meet up! Now I am off to have some food before going for a walk in the evening.